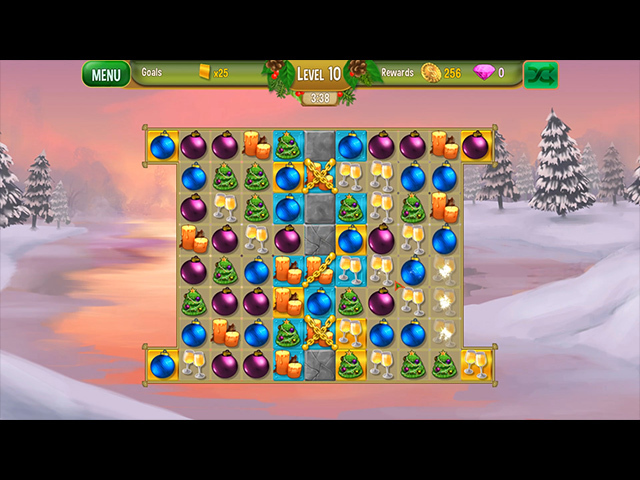 Help Jack, her loyal advisor to decorate the garden for a magical Christmas season in this merry match-3 game! Play over 119 levels, collect coins and special jewels, purchase plants and decorations to design the most beautiful garden this Christmas! 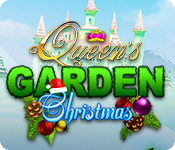 Queen's Garden Christmas is rated 4.2 out of 5 by 18. Rated 5 out of 5 by Kafinkee from Strategic moves pay off I purchased this game today after playing the demo a couple of days ago and am glad I did. I'd waited for a good sale because I didn't think the M3 play was worth full price but I've changed my mind after playing on to level 32. Yes, it's easy to clear most of the boards (at least early on in the game) without any stress but one becomes more aware of the importance of earning some bonus coins while doing so as you get further into it. Not only are you given a large garden to fill with a wide variety of plants and objects that you have to purchase with those coins and diamonds but after finishing level 30, another garden becomes available for you to plan and decorate. Further on in the game, yet another (and another...I don't know how many altogether, haven't checked that yet) also open up for you. I'm going to be one heck of a busy gardener as I progress! To earn more coin so you can decorate like mad :-), you'll want to plan your moves so that you line up those larger matches that earn you either those bonus coins or valuable bonuses you can use to much advantage to earn even more coin or remove unwanted tokens/icons. 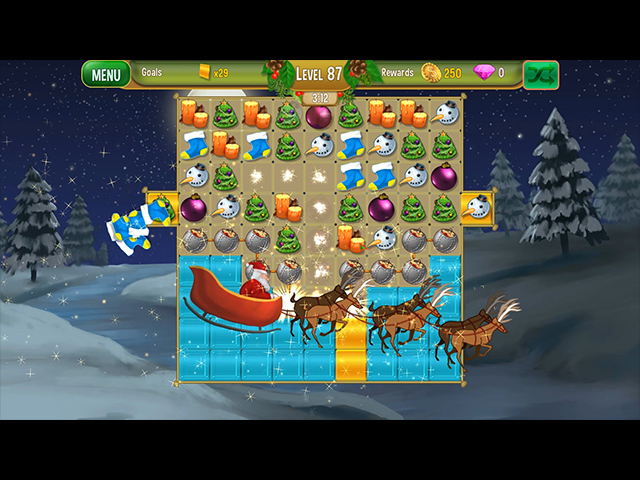 That Santa sleigh that "appears" and flies over the board is actually a valuable bonus you created with a match 6. Match the resulting sleigh icon on the board with any token of your choice and all like tokens on a large part of the board disappear as Santa's sleigh flies over. It's one of a few new bonuses and obstacles that have been keeping me interested and entertained so far. Using your bonuses wisely is even more important if you're playing in timed mode. I'm having good (and relaxing/stress-free) fun planning and building my garden(s) AND planning the most rewarding moves I can make to clear each M3 board. The Christmas-themed icons/tokens are pretty nice and the music's fine with me, too. Game play is smooth and nicely paced (you choose style to play). It's as easy or as challenging as you personally want to make it. So, there's not much more I can ask for in a game -- only that it continues to entertain after many more levels, of course! Rated 5 out of 5 by HeavenBound7729 from Love Playing In The Queen's Gardens! I didn't need the demo, to know I would purchase Queen's Garden Christmas. I own all the games and hope we are blessed with many more of them. They are quite therapeutic for me, as they take my mind to a peaceful place while designing my gardens, Right now I am rearranging the garden in Sakura Season for the umpteenth time. Eventually it will look just right, at least until I finish my cup of coffee! 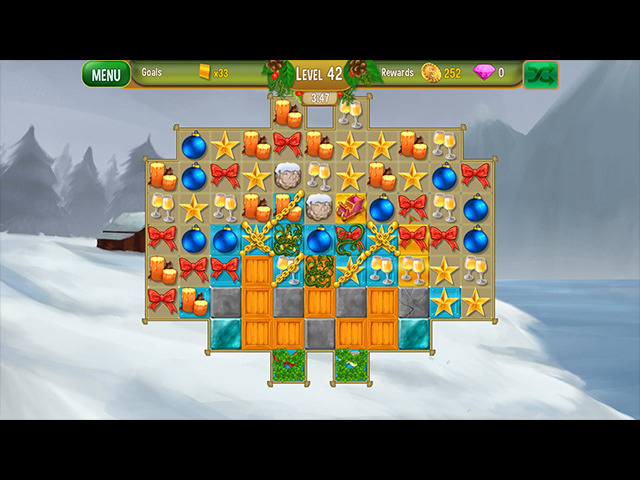 (lol) The Match 3s are fun and very relaxing, lots of different features and lovely tiles. But I am always anxious to just move on to the garden. I enjoy the music in all the games, especially Sakura Season. These "building" games are so addictive, at least for me. They have tremendous replay value, there's no end to how many times you can change them around. Just lots and lots of fun. I have never run into any glitches or stalling. The graphics are always full of color and beauty. But I would love to see a bigger selection of both ground and garden items. Well, thank you Big Fish for bringing us these lovely games. They are really a refreshing change from all the evil, soul snatching characters that have taken over our fish pond. At least take a trial run in one of the Queen's Gardens, you just may become a big fan of this delightful series. God Bless.... Happy After-Christmas Shopping! Rated 5 out of 5 by iou001 from Relaxing I wasn't expecting to like this game but I'm glad that I'm wrong. The graphics in this game are pretty and clear. The game play isn't stressful and I love the gardening aspect of it. I don't know if it plays music because my volume is turned off. This is the type of Match 3 game that I will be playing over and over again all year long. I'd love if they could make one for building and decorating houses just as nice as this one. I'm definitely recommending this to my friends and Match 3 players. Rated 5 out of 5 by DivaBella from Just in time for Christmas Wow this Queens Garden is I think the best one so far. It is so cute when you get the power up for Santa to come across the screen to take away goodies. You need try it ..I did and bought it after the trial. Rated 5 out of 5 by joybelle_1 from A forever game This game is a delight. There are five profiles available and six gardens to be made for each one. There are three modes of play, timed, relaxed, and super relaxed where you don't even get to see the weeds grow. It is a standard M3 and very much in the style of previous games in the series, but they are generous in this (must be the season) and you are given tasks of buying certain plants which may cost you less than $100 and they reward you with twice as much for completing the task, and if you don't like the plant you can remove it anyway. There are as well manmade items which also include large Christmas decorations for the garden. There is even a button where you can see your game in summer mode if the snow makes you chilly. The game board is very colourful, and the tiles extremely clear, even the bonuses which remove tiles or blow them up are themed (a santa sleigh, a bauble instead of a bomb etc) There are the usual M3 tiles of obstruction, match 2x or concrete to make matches next to several times..and obviously there will be growing weeds (but I am not that far yet) The only thing I haven't encountered yet is any mini games, but you don't need them to make money, just complete the tasks. This really will be a game you will have to play for a long time. A nice one to bring out each year and re-arrange your garden. Enjoy! Rated 4 out of 5 by Dahlia2012 from Waited Forever for This Game I had hoped the devs would have given us this game a few years ago but we had to wait longer. It's nowhere as good as the Halloween version. There's not a lot of strategy to play the puzzles and I didn't feel challenged at all. Completed the entire game and was left almost dizzy with the unnecessary flying Santas zinging across the screen every few seconds. And the Santa who kept popping onto the screen to tell me the item I should be searching for (rope, hammer etc). These little "Tricks" are distracting in a bad way and disrupted the flow of the game. I wish the QG games were more challenging in the spirit of the Halloween version which is the best one of all, IMO. I prefer having powerups to use in strategic ways in order to finish a puzzle. The game was just "ok" but nothing to rave about, IMO.